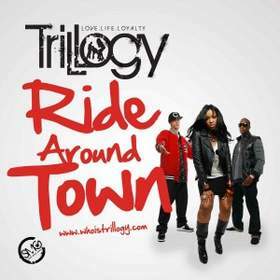 MONTCLAIR, NJ--(Marketwire - January 16, 2011) - Unsigned musical titans Trillogy seem to have hit a home-run with their brand new single "Ride Around Town." These two-time Underground Music Award winners have been featured on MTV.com, Reverbnation.com, MusicLunge.com, AOL.com and have been a featured artist for a Microsoft Windows campaign. "Ride Around Town" is the first single off of Trillogy's innovative concept of releasing their first album in three installments combining three six track EP's "Love," "Life" and "Loyalty" all set to be released three months apart. Staying true to their moniker of "Love, Life & Loyalty" Trillogy will be focusing on the elements which encompass their emotions, lives and beliefs throughout their music. Often]compared to The Black Eyed Peas, The Fugees and City High by the media and music lovers alike, Trillogy effortlessly infuses Hip/Hop, Pop and R&B to create their unique sound. This trio reigning from New Jersey has been spending the past couple of years performing shows at some of the largest and most prestigious venues N.Y.C. has to offer, such as Santos Party House, B.B. Kings, S.O.Bs, Don Hills and Time Square Arts Center just to name a few. The trio has already made big waves in the hip-hop scene, with Underground Music Awards accolades for Best Hip Hop Group in 2008 and Song Of The Year in 2009, as well as being chosen for MTV's Needle In The Haystack Artist of the Week and Microsoft Windows Hip Hop Artist of the Month. Trillogy's records have also been played on MTV's hit reality series "Taking The Stage." Having dropped numerous mixtapes and having released many songs all over the internet. The undeniable affirmation of fans from sites such as Jango.com, Reverbnation.com, and MTV.com coupled with the high volume of positive reception from industry titans such as TJ Chapman, Chuck Creekmur and Green Lantern has given Trillogy the incentive to work on their debut album. Working diligently day in and day out to create a Masterpiece, Trillogy has collaborated with Grammy-award-winning producers The Soul Diggaz, Fanatik N Zac, Louie 'Phat Kat' Vega, Jim Jonsin and Tom Slick. With the online blitzkrieg of their first official single 'Ride Around Town' the responses have been overwhelmingly favorable. The No 1 social media music community Reverbnation has decided to feature the single on the homepage recently. Played everywhere from TV, Radio and the Internet, it's a fact that this TRIO is only destined to go to the top. Their ability to make hit records with a Pop/Rock and Hip Hop influence has labeled them true musical virtuosos. Trillogy's single 'Ride Around Town' is also currently being worked by Digiwaxx.com, Future Star, TJ Chapman and MP3Waxx in preparation for release of the album. It seems that Trillogy is here and it's time for you to get familiar! Trillogy gets Music Video Distribution to iTunes through Music Lunge.